Many misconceptions and plenty of misinformation exist in the marketplace about facelifts and the procedure that is now referred to as a mini lift. A friend’s facelift will always be different from your personal facelift procedure. It’s hard to understand how even a masterful facial plastic surgeon can turn back time to reveal a new, younger-looking you while maintaining your natural appearance. We consider it an honor and our top priority to customize each facelift procedure for your needs. At Smith Cosmetic Surgery, a big part of what we do during each complimentary consultation is provide answers to these questions and more. Since Dr. Brent J. Smith and his team at Smith Cosmetic Surgery address these types of concerns every day, we’re very aware and in tune to what you might be wondering about right now. So let’s look at some of the most commonly asked questions about our most popular procedure: the facelift. What’s the difference between a facelift and a mini lift? Just words, really. 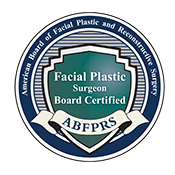 Facelift is now considered a rather dated term for describing modern facial plastic surgery, especially for medical professionals who specialize in the head and neck region. In the past, facelifts were performed with larger, more invasive incisions, often with less customization and fewer technologies available for speeding the healing process. Today, most surgeons, including Dr. Smith, refer to a facelift as a mini facelift or “mini lift.” Why? Because while this widespread procedure is still a surgery involving incisions, the industry has become smarter and more efficient and effective at performing it. The tricky thing about the phrase “mini facelift” is that it can mean slightly different things to different plastic surgery practices. For example, some offices have gone so far as to call the contemporary facelift a “lunch-time lift.” At Smith Cosmetic Surgery, we are careful not to use such terminology, because although the procedure moves relatively quickly and healing times have shortened, all facelifts still require surgically manipulating muscles, tissues and skin to address the ways the lower face ages. When Dr. Smith performs surgery he is very clear with patients that while this may feel like a “mini” surgery, particularly in the careful hands of someone medically trained to work specifically on the face, it is still an operation that demands healing time. The quick—and promising—answer is “forever.” By that we mean, we all continue to age, but you will continue to look more youthful than before a mini facelift procedure with Dr. Smith. In effect, a facelift is a surgical procedure that “starts you over.” Think of it as beginning to age from that point forward. There will always be genetics and lifestyle choices that play into how long a particular patient can “hold” the look of a fresh facelift, but there’s one consistent theme at Smith Cosmetic Surgery: You will look naturally younger than you are right now. Will my mini facelift look natural? When building a customized mini facelift map for your specific needs, it’s as though Dr. Smith is referencing a youthful picture of you that symbolizes how you’d look if you remained “forever young.” Somehow he already knows what you’ll look like. It’s kind of like magic, but not quite: It’s practice. After perfecting his art on as many as 200 patients a year over nearly three decades, Dr. Smith has become an authority on natural-looking facial plastic surgery. Because he’s become known as the Denver surgeon who produces some of the most natural-looking results, people come to Smith Cosmetic Surgery from around the city, state and across the country to look like a younger version of themselves. In fact, many of our patients have told us about the questions they are asked after getting a rejuvenated face from Smith Cosmetic Surgery. Interestingly, they are never about the name of the plastic surgeon or how “taut” their skin looks, but rather about how they got such a rested and vibrant look. Comments often involve what the patient might have changed about their eyes or hair. We know that this is a sign that the results of the facelift are exactly how Dr. Smith planned them to be—completely natural. Will I see scars after my facelift? First, let’s address the word “scars.” With the finely tuned instruments Dr. Smith uses to make incisions during a mini facelift there’s really no visible marking that resembles a scar following a facial plastic surgery procedure. The tiny incisions where Dr. Smith gently manipulates muscle tissue to enhance the look of the face are virtually invisible. What’s better? Even if you were looking for them, these incision points are well hidden at the hairline and inside the ear. While you might be able to detect them with a magnified glass, one would be hard pressed to see these minuscule healing points with the naked eye. While these hidden incisions may take between six and eight weeks to disappear completely, you don’t have to wait to get on with your life following a mini facelift. Women, for example, can wear their hair up in a professional setting or while working out without anyone knowing they had surgery. The answer to this question varies by person. If you are coming to Smith Cosmetic Surgery later in life with weakening skin collagen—or after many years of smoking, drastic weight changes or heavy sun exposure—clearly your skin and its supporting structures will require an additional level of surgery than a younger individual with healthy skin and lifestyle. We don’t judge our patients. We consider it an honor and our top priority to customize each facelift procedure for your needs and then set expectations for a realistic recovery time for your specific mini facelift. With that in mind, we are confident in reporting that, with a little concealer, most Smith Cosmetic Surgery patients are ready to go out to dinner in as few as two weeks. One of the most interesting things about recovering from facial plastic surgery is that it’s not really downtime, but rather healing time. Like any surgery, the first few weeks require your body to work extra hard at recovering and regenerating skin cells. After that initial window, your face continues to rejuvenate in small increments each day and reveal your new look over several months. In fact, it’s a beautiful process as a younger more naturally looking appearance comes to light each morning. 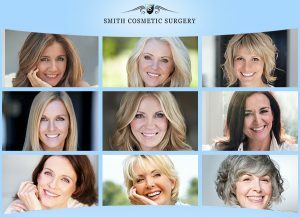 Smith Cosmetic Surgery is happy to answer any questions you might have about our mini facelift procedure. 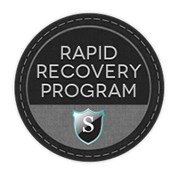 Don’t hesitate to reach out to one of our trained professionals or schedule a complimentary in-person consultation with Dr. Smith himself. We are here to put your concerns to rest.